Recently back from spending 2 ½ weeks working with the American Red Cross on Long Island (there were a couple hundred volunteers assigned here). Many of us, including me, spent the time working at a (client) shelter for people displaced by Hurricane Sandy. The Red Cross provided food and ran the shelter, while a combination of agencies (Red Cross, FEMA and Social Services) worked with clients on moving forward to rebuild or relocate. Many other Red Cross volunteers served as crews on the Emergency Response Vehicles delivering meals and supplies to residents affected by the storm. 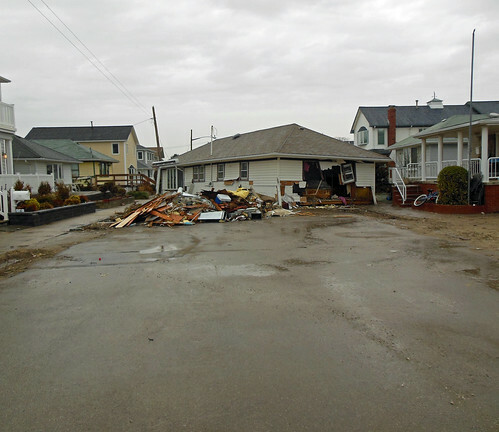 While most of my group’s time was spent at the client shelter at Nassau Community College, we did see some of the coastal areas hit hard by Sandy including Long Beach, Atlantic Beach, and Breezy Point. This allowed us to see firsthand the overwhelming power and physical impact of this storm. 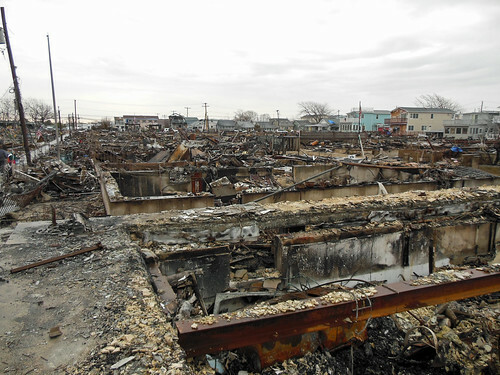 Breezy Point, located at the southwestern tip of Long Island (part of Queens on Rockaway Peninsula), is where 111 homes burned to the ground and many more were damaged or destroyed by water. 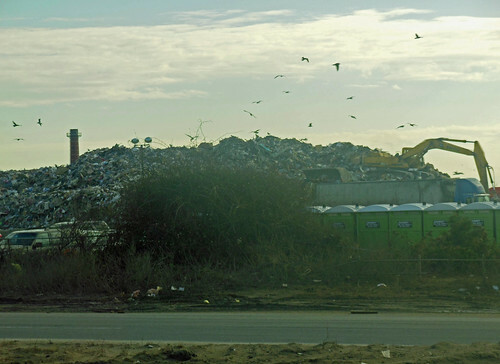 The fire was believed to have been caused by a transformer that exploded but some uncertainty about the cause remains. Miraculously, no one was killed or seriously injured. 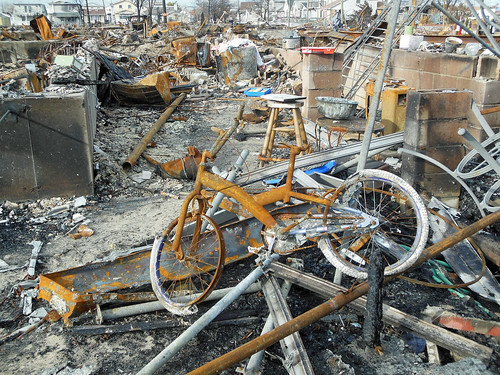 Though Breezy Point suffered the most fire damage, there were other areas with fire losses. But mostly there was water damage – thousands of homes along the Long Island coast with water damage including many completely shifted off their foundations. After the waters receded, the house above came to rest in the middle of the street. 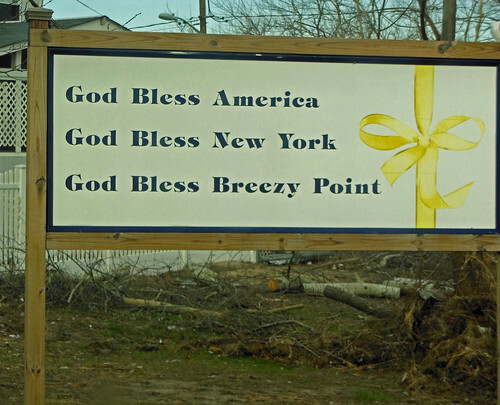 Throughout the area, the residents showed great resolve to rebound from Sandy. This is a pile of debris from the storm and as a result of gutting water-damaged houses. We also passed huge piles of debris from fallen trees and branches. It has been estimated that well over 10,000 trees were toppled by Sandy. This entry was posted on 20 December 2012 by patacoate. It was filed under iPhone and was tagged with hurricane sandy. 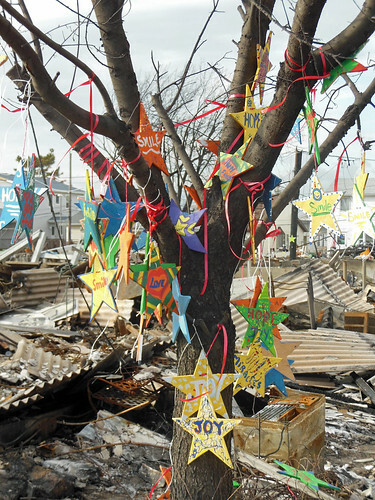 Thanks for the first hand look at the destruction there, the human spirit is strong to recover from such a disaster. I am back blogging again after some time off and I have fond memories of reading your blog for so many years. Hope you are having a good holiday season. All the best for 2013.